Mamma, why are you taking pictures? You’re not going to put this on the blog, are you? Well, yes, Patrick, I am. You’re so cute and everyone wants to see how you’re doing. Aw Mamma, my head looks like a big ol’ cotton ball now. Oh man, is he ever! He’s just suckin’ up the attention, isn’t he! You´re such a beauty Patrick, and I love to see photos from you! I TOTALLY agree – the cutest cotton ball EVER! So happy for Patrick.. thx guys for saving him before he was too damaged to trust again! Cuter than ever. What a sweetie he is. Bless you Don and Justina. I don’t think it is just because I know how much he has endured and what you saved him from; Patrick is beautiful. That is one adorable donkey! I just want to kiss his sweet nose. Patrick, it’s better than a comb over! Perhaps Don could use a little gel next time and go for fauxhawk? MeeMaw can’t wait to see you soon and I know that I will love you, Patrick, as much as your brothers! I am down with the fauxhawk! I just love his face… I cant wait to see him! Maybe Bernard can teach him how to give hugs…? Oh yes, only the cutest cotton ball ever! So glad he is so trustful and doing so great! I am just boggled at how forgiving these guys are. Given the way he’s been treated, for so long, for him to be so open to a new and better life…. Oh Patrick aren’t you just the sweetest boy! You sure did land in a home where you are so loved. Big hug to you! I could just eat him up! he’s a dollface! 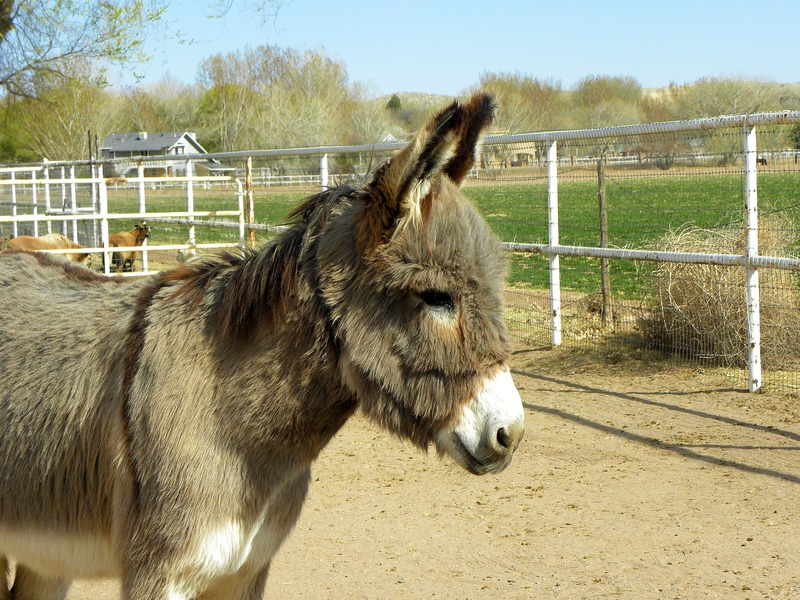 Part of me is saying “I can’t believe I’m reading a donkey blog” (so many animals, so little time) but the other part is saying “why don’t i have some donkeys?” they just look adorable. i currently live in farming areas in Switzerland and we walk by horses and donkeys all the time with the dogs. The donkeys are the best! Though the dogs are great about walking past them, I will be doing more training around horses and livestock soon so they are really well behaved, even off-leash. I can’t wait! Heeheeeheeee! Patrick-you are the cutest cotton ball on the planet!!!! Maybe we should nickname you Fabio b/c of your beautiful locks 🙂 The Count wouldn’t mind sharing that nickname! Justina-do you think that Patrick is wondering how on earth he ended up moving to a home where he is so loved and is surrounded by such kindness and tenderness? He seems like he is adapting so quickly! Big hugs to the Burrito Brothers! Patrick looks happy now. Cute li’l fuzzy face! Wanna just kiss that cotton ball forehead. 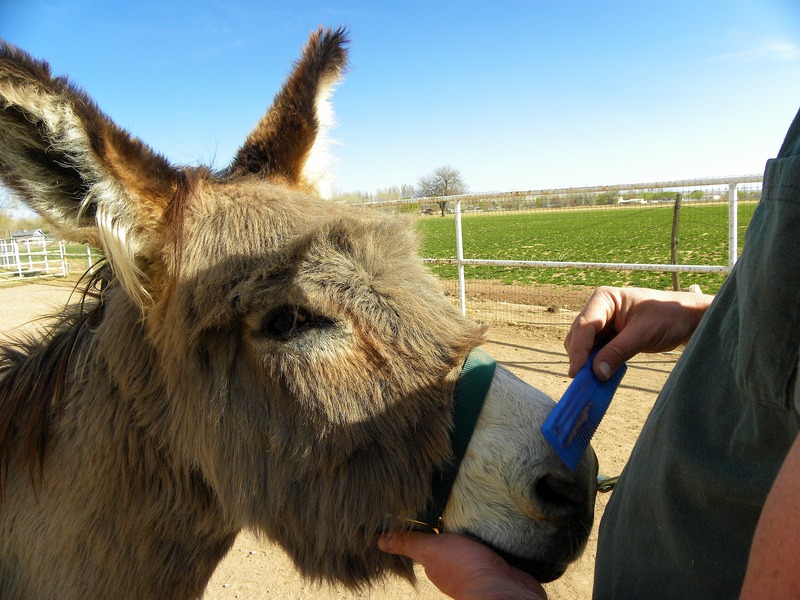 What a difference it makes with a wild donkey who has to learn trust and one that has at least been around humans. I just feel that he has been wanting this love with everything he had and when it came to him he jumped in with all four feet! He has such a sweet look. I’m so glad you brought this gentle, adorable guy home. Patrick, you’re just amazing; you have no idea. You are adorable, Patrick! I so wish I could meet you and your new brothers! And your cousins over at 7MSN, too! Dude, just be glad she didn’t bring out the highlight kit. Since I’ve taken a BREAK from my Blog, I decided to LOOK for some blogs writing about one of my Tip Top FAV animal and LOOK!!! what I’ve found! Patrick and all his brothers! They are soOOOOo SWEET! Since I pray for animals every night, here is a darling FACE of one of them! 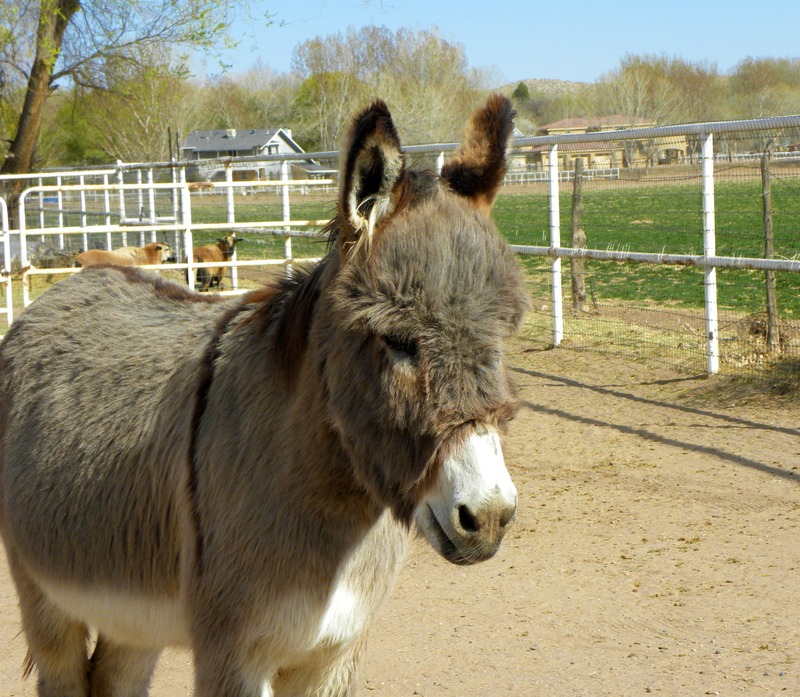 I grew up on a farm with all kinds of animals except donkeys but now I am allergic to every animal or I would have a little farm with donkeys! Thank GOD for peeps like YOU!! I’ll be back to read more of Patrick’s sad Backstory! I never knew until today about how hard some donkeys have it! SHAME on those ignorant people! Patrick, my love, you will soon learn that EVERYTHING is blog fodder. You do look fab-u-lous with your hair combed out, though.